Stairs are names for a construction designed to bridge a large vertical distance by dividing it into smaller vertical distances, called steps.They become integral part of human life and in every construction you can find stairs in one or the other design.Moreover, they are so significant that whether you like them or not but you can’t avoid them. Every thing has its own pros and cons and stairs is no exception. When we think of stairs we know that how problematic it for old people or person with disability to climb it. Not only that, but for common person to carry heavy material using them. Imagine if you want to carry something heavy with you on stairs , you probably would know that it is very difficult and risky task, sometime involved more than one person, if thing is more heavier. We all know that we can’t live without stairs , so engineers develop a machine called stair climbing hand cart which helps you to carry heavy things while climbing on staircase. 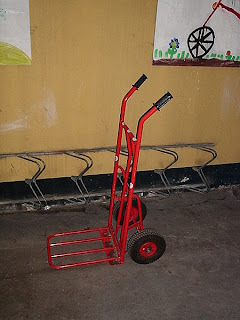 Stair climbing hand cart , as the name implies, are designed to go up and down stairs. 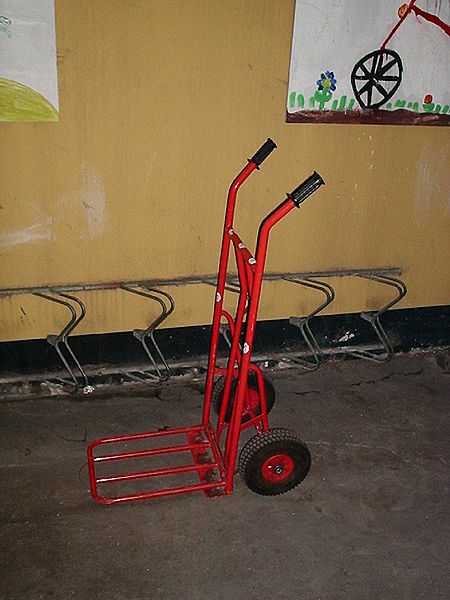 By rotating its two sets of powered wheels about each other, this machine can walk up and down stairs, much like a cog railway or a rack and pinion with the two wheels as the teeth of the gear. The wheels can roll slightly at each step to compensate for a wide range of stair dimensions.